One day before the WWDC 2012 keynote a group of Austrians hired a car and drove north to Petaluma where the TWIT podcast studio is located. We have been long time fans of Leo Laporte and his prize-winning podcast pioneering. So we were delighted to be witnessing the taping of This Week in Tech #357. One year before, when I attended my first WWDC I was less well organized and at this time Leo Laporte was still residing in what they called the “TWIT Cottage” a small house with next to no room for guests. But this year 2012 was different since just a few months earlier TWIT had raised enough money to move to their much larger current studio. Because of this emailing ahead and reserving seats was but a formality. Occording to Google Maps this trip takes around an hour, but realistically you have to add another half hour that it takes you to get over the Golden Gate bridge and out of the city. That’s not too bad, it is about the same time that it took the three buses from San Francisco to Cupertino for all the developers who wanted to pay their respects to the Apple Apparel collection. The car we had gotten thanks to great organizing by Brendan Duddridge from Tap Forms (the famous iOS database app) was fully loaded with 4 gentlemen and one lady. Being the most compact of the lot I sat on the middle seat in the back row. 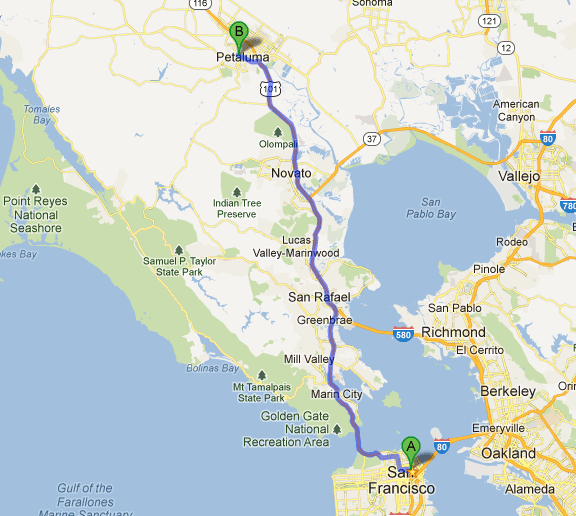 Nobody complained about lack of space as we all were ecstatic to be visiting Petaluma for the first time. Leo Laporte is running his studio like a big family. He’s the don, the star and a small army of helpers makes sure that technology, audience and organizing all goes smoothly. I had written specifically that we are iOS developers who are in town for the big event to follow the next day. I was hoping to get some time on the show, because in stark contrast to two of my traveling companions I am not camera shy. But apparently Leo has not yet adapted his style to dynamically include audience members in his shows, at least not those who are not celebrities themselves. I guess he’s just got a certain way to do his show like he always did it, his two guests dialed in via Skype and appearing on large monitors to either of his sides. This would be the first feature request that I have for TWIT: include the live audience now that you have room for one! The second room for improvement I saw with the chairs for the audience. It’s great to have the room to accommodate visitors, but your backs hurt after the show. Leo being Leo noted to me, when I tweeted him that, that with more comfortable chairs the audience would never leave! Really? After the show Leo kindly offered himself to be taken pictures with all the while with the live video stream still going on. Some funny suitable comments could be seen passing by on one monitor that was showing chat room messages in extra large letters. Leo let everybody have ample time to chat a bit and so I took the bull by the horns and used the airtime to promote Cocoanetics a bit. In the video below you might notice that in the middle of my chat with Leo the audio turns bad. This is because we were filming with my iPhone 4S and my GoPro camera at the same time, but the helping hand holding the iPhone 4S switched the recording off too soon. Everybody was assuming that I was about to raise from Leo’s throne which he graciously had offered but then I had the inspiration to mention my podcast. This turned into me pitching to Leo the idea of doing a developer podcast dedicated to iOS. With cameras still rolling you can see his brain going into overdrive and this resulted in a full second act for my 10 minutes of fame. I’m still hoping that this was able to plant a seed in Leo’s fabulous podcasting brains and maybe one day there will be a TWIT iOS podcast. The third act – which I moved before the first two in the Video for effect – was about me showing Leo the Find my Friends experiment I had been running all throughout WWDC. 114 “Freunds” symbolized by purple pins who were all converging on the Moscone Center. And while I was showing off the current state on my iPad we could see the third pilgrimage in one cluster moving north heading back to San Francisco. Leo was genuinely excited by the demonstration. 9 days after our visit I got another few minutes of airtime, or rather my iOS 6 public transit article did. This happened in MacBreak Weekly #304. I thought it only fitting to append this after my chat with Leo, sort of as an echo. Leo even mentioned that I had visited “a couple of weeks ago”. I won’t be holding this inaccuracy against him but rather I am thankful for getting another sliver of fame out of that. The material you see was recorded with two iPhone 4S and one GoPro HD (original, not the 2). My buddy Christian had begun to cut it on his Adobe Premiere but the program somehow messed up the project and made it unusable. So I could only use the first section of the video from the start until the beginning of the show. But thanks to the fabulous multi-cam support in Final Cut Pro X I was able to piece together a nice memento of the experience. I still have to involuntarily giggle: Adobe messes up, Apple saves the day … or in this case, my video. We’ll be returning to TWIT as soon as we can, at the latest when we’re coming back to San Fran for WWDC 2013. Leo, don’t forget the iOS podcast! We got you on tape liking the idea! Thanks for organizing the visit Oliver! I had a blast! See you next year at WWDC 2013!